If you’re searching for a new career, you’re probably doing everything you can. You’ve amped up your résumé, you’ve perfected your image and you’ve found hundreds of potential interview questions that you’ve been practicing in front of the mirror on a regular basis. What if you could do more? What if those questions you’ve been practicing aren’t what really matters? You could practice interview questions every day for a year and still not be truly prepared for what an interview is all about. Sure, employers want to see that you’re well-versed and able to perform under pressure – which is what an interview provides. However, what they’re really looking for aren’t generic answers to questions that have clearly been rehearsed and memorized in advance. Instead, they’re looking for certain pieces of information and clues as to who you are as a professional. While you’re preparing for your next interview, focus on what employers really want to find out, instead of an answer that sounds the same as what everyone else has to say. Some of these things are listed below. Tell me about a time that you went above and beyond in the workplace. What projects appeal to you? Tell me about a time you fell short at work. Tell me about a situation that you were forced to make a big decision in a hurry. Talk to me about one of the biggest challenges you’ve faced on the job. If you were faced with ____ (insert challenge or situation here), how would you react? Tell me about your five-year plan. What do you hope to accomplish in your professional career? Tell me about your job history; why did you leave your previous company after two years? How do you work best, alone or in a team? How would you describe your relationships with co-workers at your previous job? How would past co-workers describe you? Tell me about a time that you worked well in a team environment. When working as a part of a team, what role are you most likely to fill? Why are you interested in this job/our company? Do you consider yourself to be a self-starter? Tell me why. In what ways have you taken charge in past jobs? 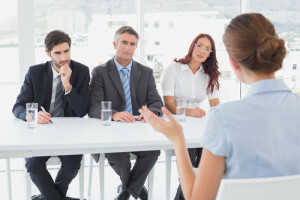 By understanding the motivation behind interview questions and what employers are really trying to learn, you can be more prepared than ever for your next job interview. Think about the qualities that you want to highlight and work them into your answers through real-life illustrations and stories. This level of preparation may be the difference between landing your next job and falling short.